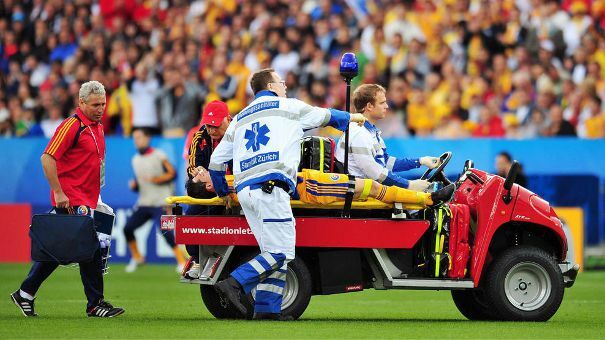 Electric ambulance with stretcher for emergencies during sports events and potentially explosive environments, tunnels and shafts, trade fairs and industrial plants. The electric ambulances are suitable for providing assistance even in enclosed areas because they are zero emission and in places that are difficult to access or present specific problems in general. The ambulance can carry two paramedics plus the injured person. Due to its reduced size and ease of handling, the vehicle can get where it is needed quickly and easily. After assessing the extent of the injury and deciding to transport the patient, the paramedics can immobilise the person using the cross belts, neck brace and head support. The patient can be taken to the nearest emergency facility, such as an ICU ambulance or an advanced medical post set up at the event without causing further injury or trauma thanks to the electric ambulance's suspension system. If necessary, emergency transport can be guaranteed for long periods of time since the vehicle has an autonomy of approximately 70 to 90 km on standard roads. 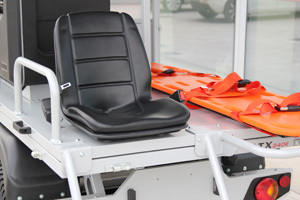 The ambulance module can be easily removed and requires installation of a flatbed or a cargo bed with drop sides. In addition to the spinal board, it also has a rear passenger seat and a compartment for the medical kit and canopy can also be added. The Alkè electric ambulance is also the ideal solution for providing emergency assistance in enclosed areas or limited space. An explosion-proof version is also available and it can also be used as an emergency vehicle for tunnels and shafts. Send us a short message if you would like to receive the prices of the Alke' electric ambulances.